Hello lovelies hope you are all wrapped up warm and toasty this morning. I got up and looked out of the window, only to discover that all the car windscreens are frosty! Unfortunately, the sun is low in the sky but really strong so if there was any frost on the blades of grass, it has melted and they all just look soggy/damp. Hello, world, this is not photogenic! So instead of sharing beautiful landscape photographs, I’m going to will the postman to bring my new tripod sooner, and I’m dreading that moment in twenty minutes when I have to put my tea down, cast off my blanket and venture out into the freezing cold world and cycle to my work placement (we still don’t have a car). What’s the world looking like where you live? Is it winter there yet? Let me know in the comments (and link me to any photos you’d like to share! I love seeing people’s photos)! Frost patterns on the car windscreen taken with mobile phone (as no camera to hand). A few seconds later, none of this beautiful frost existed, as I had to remove it to drive the car. I’ve also been nominated for a second Liebster by someone who I nominated. I’m not sure that’s quite within the rules (lol) but it was very thoughtful, so I thought I’d go along with it anyway because someone did something nice and it would be mean not to pay it forward to other people. Sneakers or heels? Depends on the event, but usually sneakers (trainers). Anything you are currently obsessing over? Photography for definite! Favorite TV show? Xena Warrior Princess. Strong female lead (in every sense of the word), solves her own problems, solves other people’s, witty, great fight choreography… Can’t wait for the new series. What old school song takes you down memory lane? Therapy?’s “Screamager” just reminds me of the beginning of my current relationship. Dessert you can’t live without? Bananas. I eat them at least once a day. Have you ever been to a concert and if so, who was it? So many concerts. Mostly metal bands and hard rock bands because they’re the best. I’ve written about them all here although I haven’t got round to writing about all of the ones I went to last year yet. What’s your favorite candle smell? That one that they always call “the sea” or “ocean” or something like that – although it really smells like aftershave because the sea usually smells like fish lol. I already nominated 5 people last week so I’m going to keep it short this time. 1. What’s your usual fitness routine? 2. How many mascaras do you own? 3. What is your favourite foundation at the moment? 4. What do you like the most about blogging? 5. What is your favourite weather and why? Keeping rabbits cool in summer can be daunting. 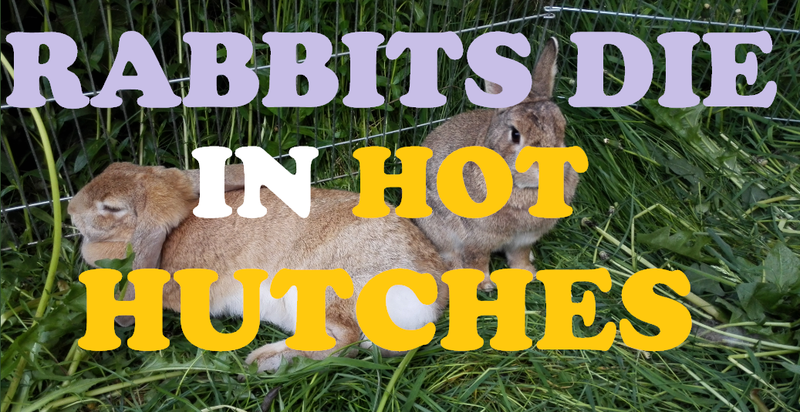 This has been the hottest week of the year in the UK, and with temperatures pretty much soaring worldwide in the Northern Hemisphere (sorry, Oz), it’s important to keep bunnies safe from sun and heatstroke too! Leave rabbits in a hutch on hot days. They need to be able to move around and find shade (or a cool breeze) and additionally, they panic if they feel trapped, which will only make them hotter. Assume their water bottles are sufficient. Rabbits have been not drowning in puddles for thousands of years, and a bowl of water that they can put their face in to cool down will really help them out. Be aware that they might knock it over, and refill as needed. Put sunblock or other human sun protection products on rabbits: It sounds good in theory, but please never do this. Rabbits will lick it off and ingest it, and sunscreen’s not good for them, and it won’t reach their skin in any case. Leave hutches in direct sunlight. Even when the rabbits aren’t in them, they will get hot and cause the ammonia from their urine to degrade. This can cause a potentially toxic vapour that can suffocate rabbits when you put them to bed. Forget to clean the hutches out at least once a week in summer. The temperature and the amount of insects around means that it’s easy for a hutch to acquire maggots, which will lead to bunny fly strike, a deadly disease. Ignore warning signs: If your bunny is visibly too hot, not really moving much, breathing heavily, and clearly uncomfortable, you need to take action (see how below). Never, ever, ever touch a nest with newborns (younger than 8 weeks) baby rabbit kittens in it: Even to move them somewhere cooler. If the mother smells the babies have been interfered with by anyone who isn’t herself, she will reject them and they will die (yes, you can try to hand rear them, no, it often doesn’t work). The mother will move them if she thinks they’ll have a better chance of survival, and she comes from a long line of rabbits who didn’t fail to care for their young (or she wouldn’t be alive herself), trust her to know what’s best for her babies, unless she’s got brain damage. Rabbits have very good mothering instincts that are better than those of most human mothers. Additionally, if you go near the nest while she’s around, she will attack you very viciously. Put an ice block or a frozen bottle of water next to the nest, but not in it, and let the mother move it herself. The only exception to this is if one of the babies needs a vet. Get them a good sized enclosed rabbit run and put them out all day in hot weather (check they can’t dig out, or make sure your garden fence/wall will stop escapes if they do, if you’re at work all day). Leave the run in the shade and remember the shade changes direction as the sun changes position in the sky. An old doormat or cardboard box over one corner of the run will provide shade. Don’t forget to give them water in the rabbit run! Freeze some ice blocks for them and put these in the rabbit run so they have something cold to lie next to if they need it. You could also put bricks in the freezer (if you remember from my article on keeping bunnies warm I mentioned putting a brick in the oven then put it in the rabbit hutch at night) and put these out in the hutch to cool the air in the hutch. Get them a water bowl as well as their bottle (or a second water bowl) so that they always have some water, and check it every few hours if it’s a really hot day. Water is the most important thing for keeping bunnies alive in hot weather. If you do nothing else from my article, do this. Keep topping their water up. Water water water water water. That’s what rabbits need in hot weather. If your bunny is visibly uncomfortable from the heat, get a jug or bucket of water and get the bunny wet. Avoid the face and ears, you just want to get their body wet to increase heat loss. If the bunny doesn’t jump up and try to run away (they really don’t like getting wet), check the temperature of their ears. If the bunny’s ears are hot and the bunny is not moving much, breathing heavily (or not breathing), and generally unresponsive, they probably have heat stroke. It is preceded by heat exhaustion, which stops them raising the alarm about their state (this is true of humans too, although in people, the face tends to go red and they can even stop sweating). This is more deadly to small animals than it is to humans (and it’s pretty dangerous to humans). At this point, you need to make an emergency appointment with the vet and get your bunny the care he needs to survive. Personally, I wouldn’t waste any time, and I’d get a sick bunny to the vet (any vet) as soon as possible because they are stuck with a fur coat and feel the temperature a lot more than we do, they don’t have a very good cooling system and they’re not designed to be above ground trapped in a hot environment in summer weather, usually they’d be in their underground burrow at this time of day in the summer, chilling out with their friends. We have, over centuries, forced them to live in our environment for our own entertainment, the least we can do is try to make it comfortable for them. This article is going to explain the different options you have to get from the end of the Trans-Siberian Railway at Vladivostok, to Alaska (or vice versa), for those people who have looked at a map and thought, ‘gee, Alaska and Russia are real close, I bet I can go from one to the other.’ My friends, you are in luck, and I’ve done all of the hard work of research for you. Why am I sharing this? Recently, I’ve been planning an ambitious if uber-budget (like, as cheap as it can get) round the world trip that will require me to get across the Pacific. My general preference is to fly the shortest distances at all times to the nearest land with an airport if it’s possible to go onwards, because let’s be fair, I could just fly on a plane around the world and it would be very, very boring. It all started with a Trans-Siberian railway idea. You may already know that the Trans-Siberian railway ends either in Beijing or Vladivostok, depending which of the two you want to go to. Both take 6 days, I believe and they both cost about £450 for a one way trip in 2nd class (see Seat61 for more on train journeys across Russia). That left me (on my proposed itinerary) stranded in Vladivostok with no onward travel. So I looked into whether it was possible to get from Russia to Alaska across the Bering Strait as one of several options (most of the others being to finish in Beijing and fly somewhere). In this article, I wanted to only talk about how to get from Russia to Alaska, since information on this appears to be very limited with loads of sites saying it can’t be done or being deliberately vague because they didn’t actually know. When I updated the article in February 2016, I have also included information about how to get from Alaska to Russia which is MUCH easier. Can you get from Russia across the Bering Strait to Alaska? Yes, you can, although the amount of effort or money involved may leave you changing trains and going to Beijing International Airport instead, for a flight to somewhere less undeveloped. The last thousand miles or so of Russia are still remarkably untouched, like a corner of the world that’s still how it was before agriculture caught on, punctuated with the occasional Soviet-era city or town, and many traditional settlements. 1. Fly from Vladivostok (or Khabarovsk) to Petropavlovsk-Kamchatsky, then get a flight from Petropavlovsk-Kamchatsky to Anchorage, Alaska, with Yakutia (www.yakutia.aero), a Russian airline. It’s about a 3 hour flight and goes every Saturday from 11th July to 29th August as it’s a seasonal flight. You can also travel from Vladivostok to Khabarovsk (or get off the train early) and fly from there to Petropavlovsk-Kamchatsky. This certainly seems to be the most reliable way to get out of Russia towards North America without going to Beijing or Seoul. To get to Petropavlovsk-Kamchatsky, you can use any of the following airlines from either Vladivostok or Khabarovsk: Aeroflot (operated by Aurora, use the Aurora site to plan this flight), S7 Airlines, then Ural Airlines only goes from Vladivostok and Yakutia Airlines only goes from Khabarovsk. Why do you need to fly from Vladivostok (or Khabarovsk) to Petropavlovsk-Kamchatsky? There are no roads. Literally, the last 800 miles or so of Russia has no roads or railways, not even dirt tracks, literally no thoroughfares at all, connecting places with each other, there are just the occasional towns and villages (which do have roads). Some, like Petropavlovsk-Kamchatsky, are on the sea and sometimes get freighter traffic. Many other settlements in this area are inland and very isolated. These were the frontier towns during communism, and now, they lie abandoned, the new government seems disinterested in building roads to connect them to anywhere, and their concrete buildings are falling down. There aren’t even any maps aside from Google Earth – literally, this sheet map is the furthest east I could find a paper map for, and it pretty much ends with Vladivostok! It has been suggested that freighters are another way to get from Vladivostok to Petropavlovsk-Kamchatsky, but there are no regular sailings, I don’t speak more than two words of Russian, so I certainly can’t learn enough Russian to get a job or follow technical instructions by the time I travel, and anyway, I am female and therefore not being physically strong enough to do a lot of work on a freighter, even if the captain would allow me to try, which is unlikely, and freighters are unreliable as a mode of transport – your visa could run out while you waited for one to turn up, so I disregarded this option as impractical. A note on Google: Petropavlovsk-Kamchatsky confused it on some of the ‘maps’ searches, Petropavlovsk did not, Kamchatsky did, so the best search term for information on this place is Petropavlovsk. Some people call it Kamchatka but Google struggles with that too. 2. Travel from Vladivostok to Provideniya, the furthest airport towards the Bering Strait, from there, you can charter a plane from Bering Air, an Alaskan company. They fly Nome, Alaska to Provideniya, Russia and may be able to pick you up in Russia if all your visas etc are in order, and if you’ve arranged this with them. They will probably want you to pay the cost of a return flight because they fly out from Alaska for Alaskan tourists to have trips to this isolated part of Russia, but you don’t need to charter a whole plane; you can potentially do it as a “seat fare passenger” when a plane is bringing American tourists over. I would still expect it to cost some money, however. You need to book this at least three weeks in advance of when you wish to travel so they can arrange all the paperwork which needs time to get from Alaska to Moscow. Email them for further enquiries as they don’t have a scheduled service. This method has the advantage of the shortest flight from Russia to Alaska, but the disadvantage of being complicated and unreliable and potentially expensive. This is a complicated multi-step trip requiring more than one short-hop flight due to the lack of roadage. Basically, from Vladivostok you need to go back upwards to Khabarovsk (or get off the train early, but then you’d miss out on Vladovostok, which may or may not matter to you), then you can fly from Khabarovsk to Anadyr (Ugolny airport, which is 11km east of Anadyr), then from this airport you can get a flight to Provideniya, from which you may be able to charter across to Nome or Anchorage using the information in the paragraph above. 3. You can walk across the Bering Strait when it is frozen solid, however, it’s about 53 miles of ice, after 800 miles of no roads and wilderness in Russia, and the US immigration office might frown upon your arrival in this manner (but at least they probably won’t arrest you if you have all the correct documentation such as a Visa, not sure where you’d get your exit stamp for Russia, though). There has been one known case of someone doing this in the opposite direction (they described the whole adventure as “brutal”) and they got into a lot of trouble with the Russian authorities because, due to lack of roads, it was impossible for them to register themselves at any police station in Russia within 24 hours of their arrival in the country. Oops. Other alternatives may include horseback or cycling if your off-road biking skills are outstanding, still not sure how you would cross the rivers, however. Those are all the options I’ve found so far, as there are no direct flights from Vladivostok to anywhere in the U.S or Canada (but you can go on a 35 hour flight changing at Moscow going back all the way around the rest of the world to get to Anchorage or Seattle or anywhere else in North America if you’re set on using a plane and have loads of money). None of them come up on flight comparison services because they are not really comparable with anything. There is literally one option at every stage. Pricing information is also a bust so I don’t know how much any of this costs at the present, but I would guess at least a couple of hundred at each new flight. It’s also worth noting that the NAVTEX stations over that corner of the world don’t appear to be very well maintained so navigational information is often unavailable, which can lead to some scheduled flights being grounded. Since I wrote the original article, I have found a company offering charter flight services who may be able to take you from Anchorage to Petropavlovsk-Kamchatsky (or to Vladivostok or Provideniya) or (less likely) Petropavlovsk-Kamchatsky (or Vladivostok or Provideniya) to Anchorage. This cuts out ALL of the uncertainty and means you will be able to go straight from Alaska to Russia or possibly vice versa with an reputable, accountable company organizing your independent journey by finding you a pilot and a plane. If you wish to book a chartered flight, you can find one here: Villiers Private Jet Charter. Villiers has lots of private pilots with planes around the world and is most likely to be able to meet your needs. Most charter flight services depend on where the individual pilots are based, but there are a lot of people in Alaska with planes so this is your absolute best option if you want to go from Alaska to Russia rather than the other way around, especially since you can book a flight for a date and time which suits you. There are some private charter jets offering the reverse journey (Russia to Alaska) but these are thin on the ground. To offset the cost, it would be well worth finding several other people willing to accompany you on this journey, and on a private charter flight you should be able to take items such as bicycles as well if you needed to. Do you have any further information on how to cross the Bering Strait from Russia to Alaska, or in reverse? You can email me at invokedelight@gmail.com if you have managed to do this or if you have found any other ways of getting across, or know of a ship that travels this route and takes passengers (not freighters, as explained above), please do let me know I would love to hear how you have done this journey and can add your perspective to this article. If you have a first-hand account of the journey that you’d like to share with the world, I’d love to put you up as a separate article as a guest post (your name to your article, you keep copyright etc) if you email me. I am particularly interested if you’re female as all the articles I’ve read so far seem to be young men in their 20’s and 30’s who have even considered doing this journey. NOTE: I am not a travel agent, please don’t email me asking for detailed travel advice! 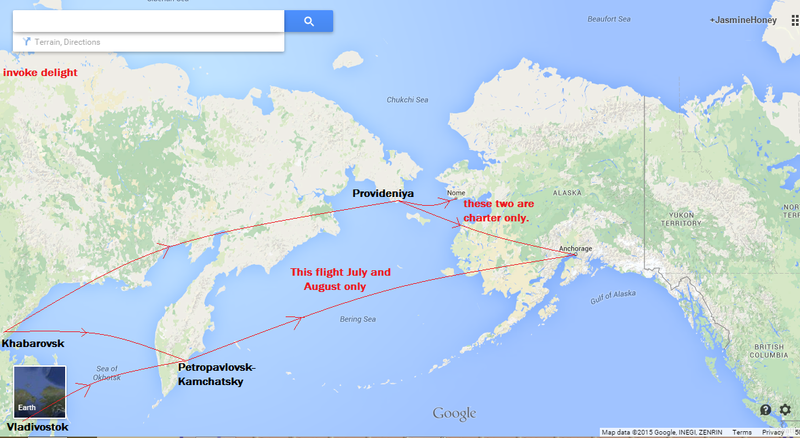 This map shows an overview of the ways you can get from Russia to Alaska by air. Click to enlarge. Base map: Google maps. Additional layers: Invoke Delight. Travel Article on crossing the last part of Russia and the Bering Strait Please note this information is all very old and was last updated in February 2006, after which the author appears to have lost interest in further research into this topic. Yakutia airport website flights from Petropavlovsk Kamchatsky to Anchorage, Alaska, this is the flight schedule, they only fly on Saturdays in July/August and not at all the rest of the year. Off the unbeaten track Travel information for Petropavlovsk Kamchatsky. The Other Side of Russia: A Slice of Life in Siberia and the Russian Far East by Sharon Hudgins: This is the only book written about extended travel in far Eastern Russia although I don’t think she offers much helpful advice for making the journey between the Bering Strait and Alaska, there is a lot of information in this book which gives some eye-opening insights into life in this part of Russia. Villiers Private Jet Charter the website for the private charter jet services. I am an Amazon Associate. This post contains affiliate links. This does not affect the prices you pay, I just get a percentage of their profits which frees up more of my time to bring you accurate, up to date and informative content. Hair: What do I use between the silver shampoos? What do I use between the silver? To maintain my silver hair, I have to take good care of it by making sure it stays nourished and conditioned. This article is about how I do that. Claudia Schiffer Omega Complex: It’s drugstore available, the shampoo has got sulphates and yet somehow, this Omega Repair Mask makes my hair feel softer, smoother and fresher than anything else. It goes against modern hair advice, due to being less than $10 a bottle and the shampoo being all sulphatey, but maybe my hair needs that sometimes. This is my most frequently used pair of non-silver products. Pure:Ology Shampoo: I was put onto this by this Grazia article I read, where 3 fashion editors explained how they cared for their long blonde hair. It was really informative and full of product recommendations, although not all of the products are as readily available as of 2015 as I would like. The shampoo is gentle, and smells nice and doesn’t leave deposits or take weeks to wash out. Gliss Liquid Silk Conditioner: Another cheapo fave, this one is something I’ve been occasionally using since 2005, when my older cousin told me about it when I was in high school. 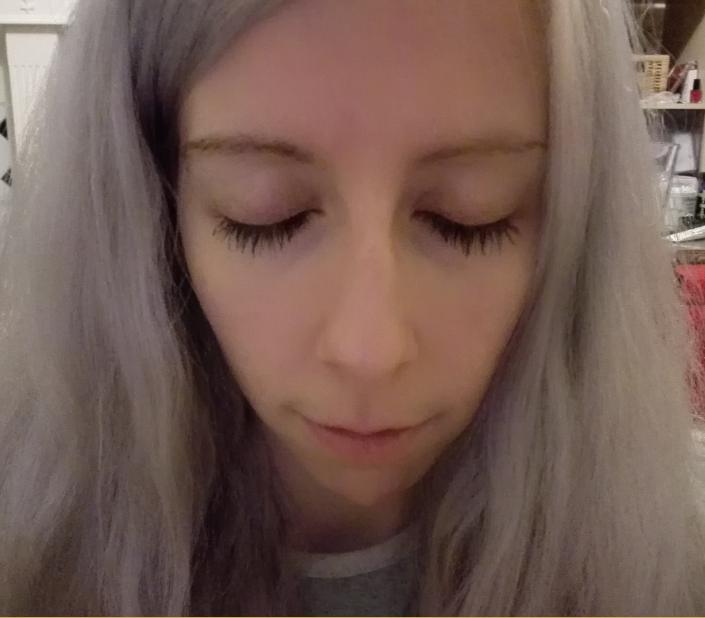 It leaves my hair soft, shiny, moisturised and each strand really sparkles almost like I’ve used one of those shine sprays on it. It’s called Gliss Kur in the US. Aussie 3 Minute Miracle Reconstructor: Does what it says on the bottle. Bung it on your hair, leave for a few minutes, and your hair will be softer than a Sheila’s jumper. This stuff really makes my hair look and feel great, I use it once a week and it vastly improves my detangling as well. Moroccan Oil Shampoo: I was using this for a very long time (the Moroccan Oil brand), it actually used to be my favourite before I transitioned to extra-super light blonde. Now I can’t use it, which is a shame because I generally found that when I used this, I needed no conditioner. Like, literally, I had the whole set, but the shampoo would always run out three times before I’d need another conditioner, which I only put on my ends. If you’re a warmer blonde, or any other hair colour apart from platinum, silver or white, this stuff is the best shampoo you can get. Sadly, it orangeifies your hair as it’s infused with argan oil and through experience (over time it actually made my hair 2 shades darker!) it’s just not compatible for me if I want to have icy light hair. Also it’s like serious cash per bottle. So that’s a run through of the products I use to wash my hair between silver shampoo sessions. There’s also the stuff like coconut oil that I use between washes, but the other stuff I use between washes is highly variable and I don’t feel like I’ve got a regular, dependable and results-focussed set of products going on in that category yet, so it’d basically just be an article on coconut oil, only I don’t use it as often as I might, so it’d be a really short article on coconut oil. My main point, however, is you don’t need to spend serious cash to maintain your silver hair, if you choose your products wisely. Author MsAdventurePosted on March 28, 2015 June 17, 2015 Categories beauty, hairTags argan oil, blonde, blonding, coconut oil, color, colour, conditioner, damaged, dry, hair, hair and beauty, haircare, ice, long, long hair, maintenance, mask, moroccan oil, oil, over-processed, platinum, processed, repair, restore, shampoo, silver, snap, snapping, wash, white1 Comment on Hair: What do I use between the silver shampoos? 1. 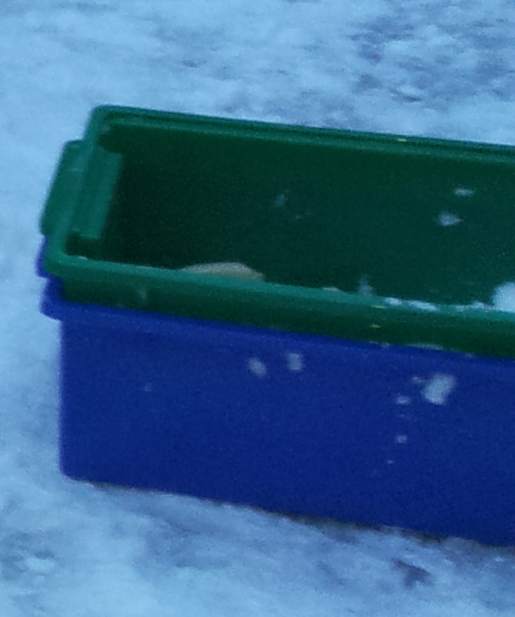 Get some large plastic boxes: Recycling boxes or storage boxes will do just fine for igloo building. A packing crate isn’t very good as it’s not very strong and the sides are full of holes so the snow falls out instead of making solid igloo ice blocks. This is the sort of box we used for the first layer of igloo ice blocks – it’s a 70 litre plastic box. The lid wasn’t much use. 2. Fill the boxes with snow. Pack the snow down in the box to make giant bricks of ice. You will need to repeat steps 2 and 3 a lot to make an igloo. These are the stronger plastic boxes we used to make the bricks from the 2nd layer upwards. I don’t know where they’re from – my OH was using them to store Lego before this. 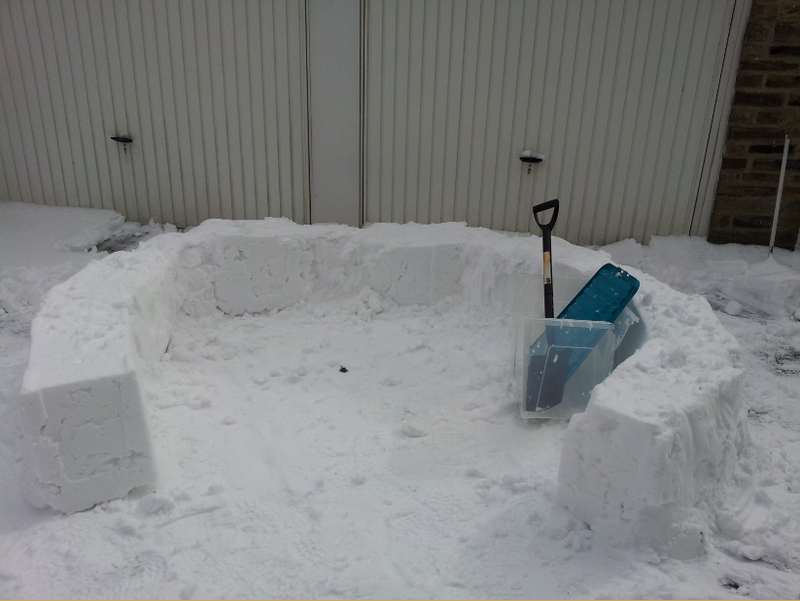 This was the first layer of blocks for the igloo from a different angle. As you can see our first box cracked and we used a smaller one for the igloo’s other layers (which made our igloo really strong). We left loads of room for the doorway. 4. Once you have a complete layer, do the same above – but don’t line the bricks up (think about how brick walls are built), and make sure the ice blocks are facing slightly inwards so your bricks eventually meet at the top. This was what our igloo looked like at our halfway point. The igloo doorway was improved with ice bricks set at a different angle for structural stability. 5. At the top of the igloo, you have two choices – some people prefer to build a capstone out of ice, to stop everything from falling apart. Otherwise, leave a hole in the top to let air in. We left a hole in the top of ours. 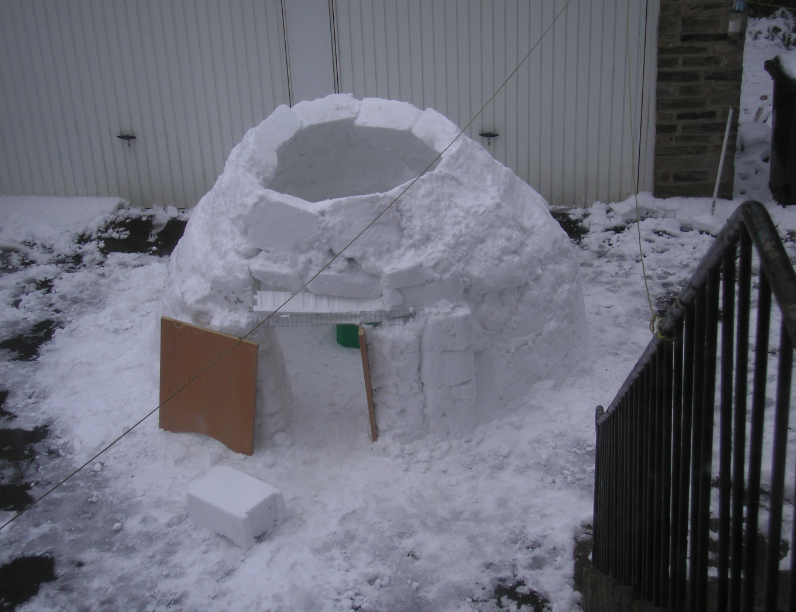 This is what our igloo looked like when it was nearly finished. The MDF at the front was used as a door when we camped out in the igloo overnight and to keep foxes out while we were building. 6. We used polystyrene and wire mesh to support the door of our igloo because the size of our ice blocks (and the ambient temperature being only -5 or so) meant the whole structure may have collapsed if we hadn’t used any support. Smaller boxes (than 70 litres) or hardening the blocks of ice using cold water would have both prevented this problem, but it wasn’t cold enough for water-hardening the ice blocks and they just melted when we tried it. For the amount of time we put into building this igloo, I was very happy to complete it and didn’t worry too much about it being 100% Eskimo-worthy. Whether you end up with a perfect building made only of ice or not, you will feel damn proud when you go inside your finished igloo. 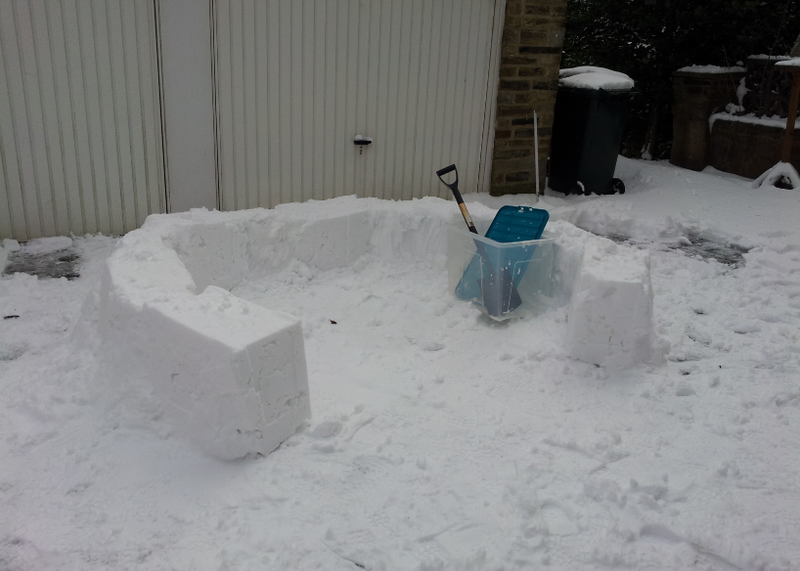 This is what the finished igloo looked like. 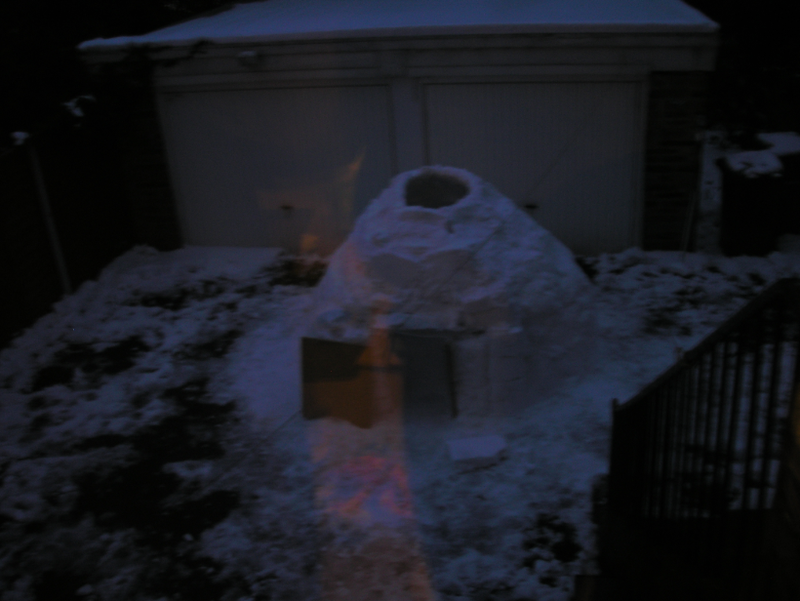 It took us about 5 hours to build, including a break every hour or so when we went indoors to defrost. 7. Now admire your igloo. Can you sleep in an igloo? Definitely! We camped out in ours with some roll mats and a double sleeping bag and it was surprisingly cosy (although we did this wearing serious layers). It also confused the neighbours which was hilarious. This is the finished igloo. We had a LOT of fun in this igloo last year. 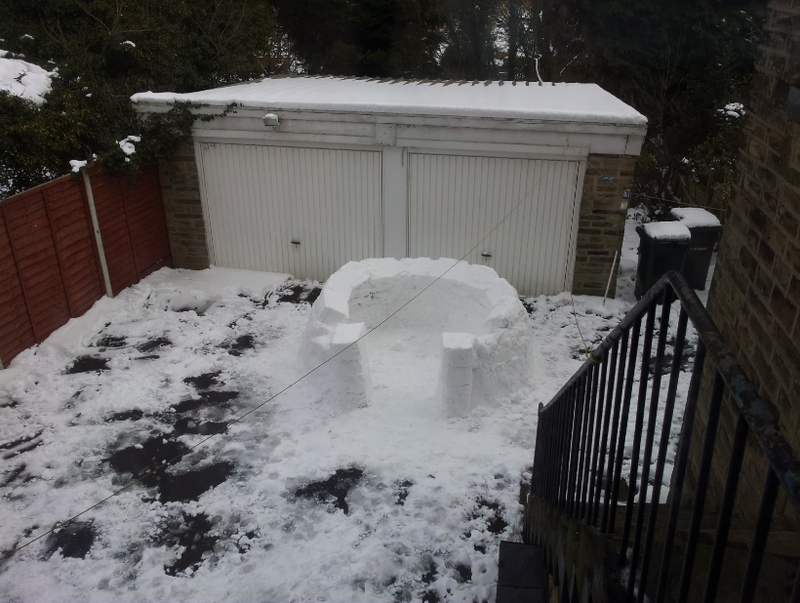 Hope it snows as much this year so we can build another igloo in our new house (and get some better pics)! 8. Take plenty of photos and share them with me via Twitter @invokedelight so I can see your awesome creations! 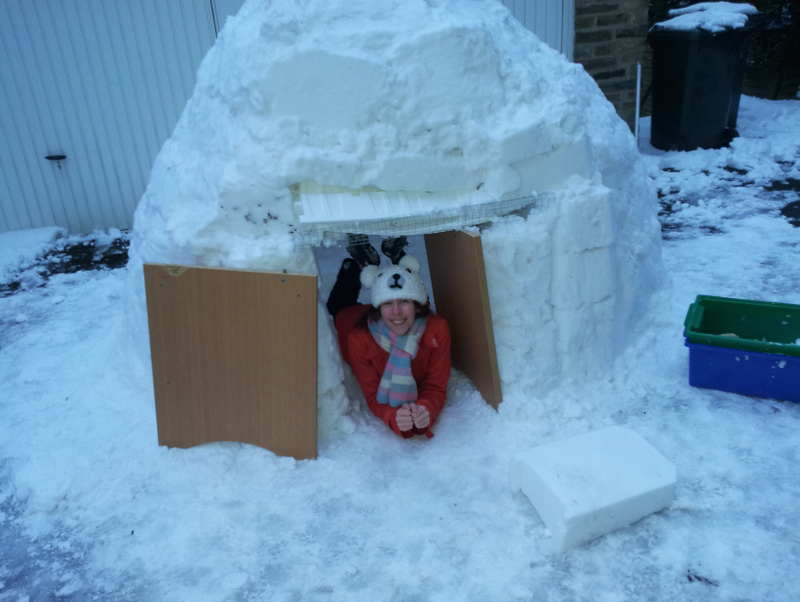 Have you built an igloo? Share your igloo pics with me on Twitter! Who needs an expensive package holiday to Iceland? You can do this in your own front garden!